Once you have logged into Moodle, there are three locations you can look to find your courses. 1. 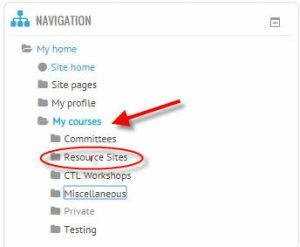 Along the left, under the Navigation Block, you will see a My Courses link with a listing of Categories containing courses for which you are enrolled. 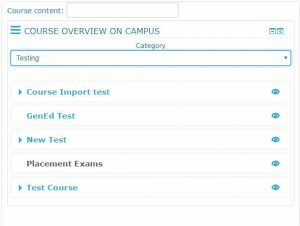 If you click on any of the Category folders, you will see your enrolled courses for that category. 2. Along the top, you will see your Banner with items such as Centre Links, My Dashboard, My Courses, etc. If you click on My Courses, a drop down menu will appear with courses that you are enrolled in. This only shows courses that are NOT hidden. 3. Finally, if you want a quick view of all courses you are enrolled in, hidden or not, look in the middle column. Course Overview on Campus shows the courses you are enrolled in, organized by Category. To change the view, click on the drop down menu and select which category of courses you would like to view. To see more about Course Overview on Campus block, click Here.